A former member of the Nazi SS has gone on trial in Germany charged with the wartime murder of three civilians in the Netherlands. Heinrich Boere, 88, has previously acknowledged shooting dead three people in 1944, as reprisals for attacks by the Dutch resistance. The trial went ahead after an appeal court ruled he was fit to be tried. However, the hearing was adjourned when the five-judge panel said it needed time to consider more legal argument. The trial is due to resume on Monday, court officials said. 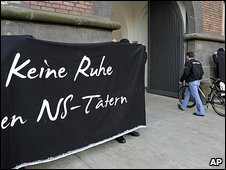 Anti-Nazi protesters had gathered outside the court in Aachen as the trial opened. Relatives of some of the victims were also in court. Correspondents said Heinrich Boere entered the courtroom in a wheelchair with a doctor by his side, but appeared alert and attentive as he answered questions. The hearing was adjourned shortly afterwards. The defendent is charged with killing three men: Fritz Bicknese, a chemist and father of 12; bicycle seller Teun de Groot, who helped Jews go into hiding; and resistance member Frans Kusters. He admitted the killings to Dutch authorities while in captivity after the war, but escaped before he could be brought to trial. He later fled to Germany. He has also confessed to his role in interviews with the media. "Yes, I got rid of them," he told Focus magazine. "It was not difficult. You just had to bend a finger." He told Spiegel magazine that he and his accomplices thought they were killing "terrorists", adding: "We thought we were doing the right thing." A tribunal in Amsterdam sentenced him to death in absentia in 1949, a sentence later reduced to life in prison. A Dutch extradition request was turned down by Germany in the early 1980s. He was eventually indicted in Germany last year, but a court in Aachen then said he was unfit to stand trial due to health problems. That ruling was reversed in July by an appeals court in Cologne. Boere, who is of Dutch-German origin, was 18 when he joined the SS in 1940, shortly after the Germans overran his hometown of Maastricht. After fighting on the Russian front, he went to Holland as part of an SS death squad codenamed Silbertanne (Silver Pine). His statements to Dutch authorities are expected to form the basis for the prosecution's case, the Associated Press news agency reports. Defence lawyers have declined to say how they will try to counter the confession. But even if he is convicted there remains some doubt over whether he will actually go to jail. 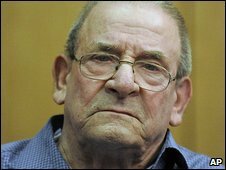 A 90-year-old former German infantry commander, Josef Scheungraber, was given a life sentence by a German court in August, but remains free while his appeal is heard.